The first time I can remember eating an Andes mint was at Christmas around 10 or 15 years ago. My grandma had gotten boxes of them for each of us, and I quickly ate my entire box and never looked back. The box o' Andes became something of a holiday tradition for Grandma and she made them available every year. Sometimes they were special flavors (I fondly recall a toffee crunch version), but they were usually the classic mint. My love for them has never wavered. What's your point, Grace? Get on with it already! I'll bet you've seen and probably used the creme de menthe baking chips, but did you know there was a batch of peppermint crunch baking chips as well? I had no idea until I found them in our cabinet at home--hooray for happy surprises, right? They were absolutely made for cookies, so cookies were made. Baked correctly, the end result is a cookie that's crispy along the outer rim but chewy toward the middle--I attribute this amazing phenomenon to the brown-to-white sugar ratio. Incidentally, in my cabinets, both are (and always have been and probably always will be) the Domino Sugar brand. I must pause to thank Domino for sending me a gift card to use toward the purchase of their terrific products and also direct you to their website, where you'll find lots of great gift and recipe ideas for the holidays. Expect to see more to come in the near future. The mint baking chips provide a smooth but subtle mint flavor (and a lovely smattering of pink) and the chocolate chips are plentiful enough to satisfy even the most ardent chocolate-lover. There's nothing cakelike about these discs, so don't expect it. Best of all? I can get my Andes fix without raiding Grandma's stash. Using an electric mixer, cream the butter, brown sugar and granulated sugar until fluffy (about 3 minutes). Beat in the egg and vanilla. Add in the baking soda, salt, and then flour; mix completely. 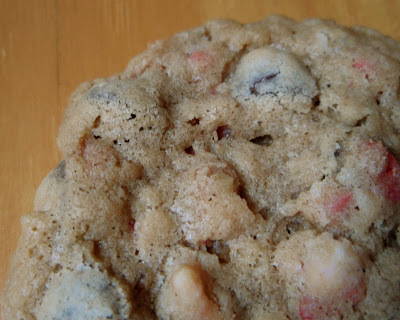 Stir in the oats, Andes® Peppermint Crunch Baking Chips, and chocolate chips. Scoop out round balls about 2 tablespoons in size for large cookies or 1 tablespoon for small cookies. Place on cookie sheets two inches apart. Bake for 20 minutes for large cookies or 12-15 minutes for small cookies, taking care not to over-bake. Oh, no. These look too good. I love chocolate and peppermint. And cookies. Thanks for this recipe! Those sound really good. It is a pity we don't have such a lovely selction of baking chips over here. You are lucky to get chocolate chips and that is about it! You are right Grace. These are perfect for a cookie swap which I will be attending this month. Thanks for a great recipe. The mix of peppermint and semi-sweet chips sounds fantastic! Wish I could grab a couple of these off the screen this morning. They sound like a very nice holiday chocolate chip cookie recipe! I did not grow up on Andes but on After Eight. Kind of the same, though, with dark chocolate... My father was (and still is to this day) a huge fan! Those cookies look great! I make a version with peppermint bark! Sooo good! Mmmm these look awesome. I'll have to keep an eye out for the peppermint crunch baking chips! Re: your comment on my blog, which made me laugh - I didn't even think about sewage + white fluffy bread = gross. I'm just so used to thinking about sewage now from my courses! Oh what a great idea for a Christmas cookie! That's my kind of cookie; crispy around the edges and chewy in the middle! I love the pink peaking through. I must make these cookies asap! I love the mint & chocolate combo, this sounds like a perfect cookie to me! I'm gonna be on the lookout for some of those Andes peppermint crunch baking chips now. I've never tried those magic little baking morsels but it looks like I'll have to. Your cookies look so, so good. I can't wait to make these. Mr. Mimi is all about peppermint. On our second date he ordered a peppermint ice cream and caramel sauce sundae. What a combo! Something about being allergic to chocolate. Luckily he has since over come his allergy! ohhh yum..I love Andes mints in cookies!! My grandma always has andes mints in her cupboard too! Every time I go over to visit, she makes sure I have one. :) These cookies look great! Oh these sound so good. I also adore all things mint. These sound delightful. I am an Andes mint FIEND. Oh my goodness peppermint crunch! That sounds amazing. Now I need to find some of these! Those cookies looks wonderful! So great! 'Nother Domino lover over here. It was just this year (or within a year... something like that) when I took a whiff of the sugar and from then on... no turning back. I think it also helps that there's only like a 10 cent difference per bag at the grocery store, too. And hooray for stuff in cookies! I always like finding new things to stuff in dough! Oh my. I'm a HUGE Andes fan myself so these look like heaven to me. I'll be on the lookout for the peppermint crunch baking chips! Of course we will not have those fabulous crunch-chips around here. We are lucky to have cable. Oh Grace. My mint/chocolate loving daughter and husband would really, REALLY dig these cookies. Peppermint? I'm in! These look wonderful. I wouldn't want to take them to a cookie exchange, though. Greedy me would want them all to stay home and keep me company. Ok, maybe I'd share one or two, but that's all! Those look yummy as heck, I adore those mints too! I love andes mint! I'm sure I'm gonna super love♥ this! I love Andes too! And just discovered their baking mints several months ago :) Your cookies look awesome! The cookies look GRAND, Grace!! Truly festive!! I will be making these for some Christmas hampers! I love Andes Mints! I think I feel exactly the same about them as you do. We used to get them in our stocking from Santy Claus. Agreed, Grace. I love the chocolate/mint combination. Your cookies hit the spot! beautiful photos as usual! those look so good im craving for mint cookies right now!! For me, a cookie just couldn't fulfill an Andes craving. Part of the specialness of the candy is clearly its shiny wrapper. The wrapper just comes off so effortlessly. It's like unwrapping some magical present that wants to be opened. I am a peppermint lover, and these look and sound fantastic! Those look scrumptious! I am happy to see that there is more brown sugar than white sugar in these. <3 brown sugar! I most emphatically buy Domino. For some reason the sweetness is right on. I also trust their brown sugar and confectioners. I have tried other brands and it was noticably different. Do I sound like a commercial. There are a few brands out there that I simply will not go generic on- this is one. Now your cookies look absolutely amazing. I could go for one with my girls right now as we just finished decorating for Christmas. So funny! I too always found Andes on my grandma's front cabinent, where she also had her little fm radio playing all day! And twenty some years later ... there's a box in my desk drawer right now! Thanks for bringing up a great memory! Oh my what a treat. I'm sure everyone here would enjoy. What a great addition to these cookies. I actually love crispy on the outside and chewy in the middle, my absolute favorite kind of cookie! These are right up my alley. What a fabulous recipe! Awesome recipe! I guess it is all grandma's fault! Mmmm... I love Andes - and these cookies look amazing!! WOW! OK. Would you mind terribly if I adapted this recipe for a cookie thing I am catering thing I am doing? These are absolutely perfect and I'd love to do a chocolate version of these! I buy 11 boxes of Andes mints every Christmas, and put one in each stocking. Truth be told, I buy an extra box to get me through to Christmas. 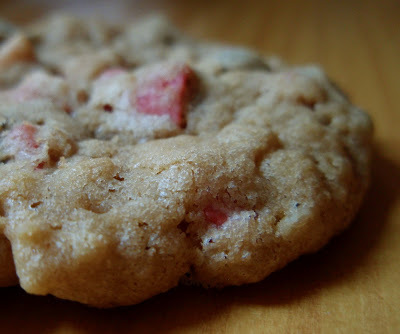 Love the chewy on the inside cookies-I crave them more than any other cookie texture. These look perfect for the holidays, and no I did not know there was a Peppermint crunch baking chip. Thanks for enlightening me! 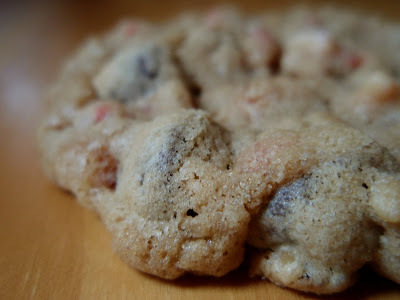 i love these cookies and the photo is uperbe and if you like french creative food coem and visit my blog !!! Love dishes that remind me of relatives. I have been on a kick making my grandma's old recipes too. No getting on with it! I love grandma stories! I love mint too and I also LOVE those peppermint crunches. You must try them in cocoa based brownies. yumyumyum! i still haven't baked with andes mints, though i keep seeing such delicious-looking things like this pop up. they must be especially great straight out of the oven...mmm. ok wait...so you have some kind of andes fairy that randomly drops stuff off in your cupboard? Not FAIR!!! YUM!!! And, I'm with Danielle...when is someone going to magically leave me baking goodies in my cupboard? I'd like to file a grievance. I happen to have some of those lovely chips in my cabinet too. They've been there a while. Looks like this is what they have been waiting for! A very timely recipe! I am a huge fan of all things peppermint this time of year, and these would make a perfect base for a peppermint ice cream sandwich. You gotta love Grandmas for their special cookies! This looks stellar! It's time for my peppermint crunch scavenger hunt!